I greatly enjoyed this mindfuck of a novel, full of magic, humor, and wonderful character sketches. Mystical and cynical, surrealistic, I’m not sure what it means, but I loved the journey. Fans of Steven Erickson should check this out. 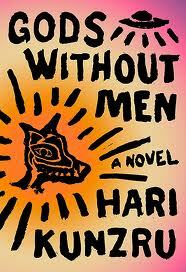 GODS WITHOUT MEN reminds me of David Mitchell’s CLOUD ATLAS, but it is more structured than that loosely book. Hippie cults, the trickster God Coyote, yuppies, freak folk stars and Spanish missionaries all converge on a mysterious rock formation in the middle of the Mojave desert through different time frames and each experience some cataclysmic event.